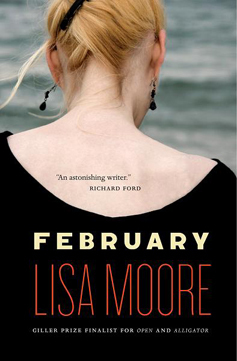 Lisa Moore’s second novel, February, got some good reviews when it first came out including The Globe and Mail, Quill & Quire, and shortlisted for the 2009 Commonwealth Writers’ Prize. In February 1982, the oil rig Ocean Ranger sank off the coast of Newfoundland during a Valentine’s Day storm. All eighty-four men aboard died. February is the story of Helen O’Mara, one of those left behind when her husband, Cal, drowns. It begins in the present-day, but spirals back again and again to the “February” that persists in Helen’s mind and heart. The story centers around a Newfoundland disaster in 1982: the collapse of the oil rig, Ocean Ranger. Being born in 1988 and from the opposite end of Canada (learning BC history in school as well as general Canadian history), I wasn’t familiar with this horrific accident. Helen is an astonishing character who has lived through the most horrible thing imaginable to me: the loss of your life partner. The book is very striking without being a sob-fest. You really feel Helen’s pain, see her emotional distance after the disaster, and heal with her through her life. The story is a very personal journey for Helen and her family, and it isn’t a particularly plot-driven or linear story. February is all about the characters and their struggle through the disaster of the Ocean Ranger and their life following it. 1982. I was 13, and perhaps at the climax of my self-absorbed state. I wonder how widely-known the tragedy was here in the US, in the mid-Atlantic region, you know, for those capable of seeing beyond the person in the mirror?